In this VBA Tutorial, you learn how to create a clustered or stacked bar chart with macros. This VBA Tutorial is accompanied by Excel workbooks containing the macros I use in the examples below. You can get immediate access to these example workbooks by subscribing to the Power Spreadsheets Newsletter. If you're a beginner, learn how to start working with macros here. Understand essential VBA terms here. Learn about the Visual Basic Editor here. Learn how to create references to cell range here. Learn about Sub procedures here. Learn how to work with methods here. Learn how to create and assign values to variables here. Learn how to specify the width of a column here. Learn how to check if a cell is empty here. Learn how to delete a sheet here. Learn how to import and consolidate data using Power Query here. Declare an object variable (myChart) to represent the newly-created clustered or stacked bar chart. Create a clustered or stacked bar chart with the Shapes.AddChart2 method. Assign the Chart object representing the newly-created clustered or stacked bar chart to the myChart object variable. Specify the source data for the newly-created clustered or stacked bar chart with the Chart.SetSourceData method. Description: The Dim statement declares the myChart object variable and allocates storage space. Description: myChart is an object variable of the Chart object data type. The purpose of myChart is to represent a reference to the newly-created clustered or stacked bar chart. VBA construct: type part of the Dim statement. Description: Chart is the data type of the declared variable. In other words, myChart is declared as of the Chart object data type. myChart is the object variable to which an object reference is assigned to. The object reference assigned to myChart is the Chart object representing the newly-created clustered or stacked bar chart, as returned by the Shape.Chart property. VBA construct: objectvar part of the Set statement, variable part of the assignment (=) operator, and object variable of the Chart object data type. Description: myChart represents a reference to the newly-created clustered or stacked bar chart. Within the Set statement, myChart is the object variable to which an object reference is assigned to. myChart is the object variable to which the value is assigned to. The value assigned to myChart is the Chart object representing the newly-created clustered or stacked bar chart, as returned by the Shape.Chart property. Description: Worksheet represents the worksheet where you insert the newly-created clustered or stacked bar chart. Use constructs such as the Application.ActiveSheet property or the Workbook.Worksheets property to return the appropriate Worksheet object. If you explicitly declare an object variable to represent Worksheet, use the Worksheet object data type. Description: The Worksheet.Shapes property returns a Shapes collection representing all the shapes within Worksheet. Each Shape object within the Shapes collection represents an object in the drawing lawyer of the worksheet. Description: The Shapes.AddChart2 method creates a chart. Shapes.AddChart2 returns a Shape object representing the newly-created clustered or stacked bar chart. This Shape object is added to the Shapes collection representing all the shapes within Worksheet. The AddChart2 method was introduced in Excel 2013 and isn't backward compatible. To create a chart in Excel 2007 or Excel 2010 using VBA, use the Shapes.AddChart method. For an explanation and example of how to work with the AddChart method, please refer to the appropriate section below. VBA construct: Style parameter of the Shapes.AddChart2 method. Description: The Style parameter of Shapes.AddChart2 specifies the style of the newly-created clustered or stacked bar chart. When you set Style to -1 (as in this macro structure), the newly-created chart gets the default style for the applicable clustered or stacked bar chart type. VBA construct: XlChartType parameter of the Shapes.AddChart2 method. xlPyramidBarClustered (or 109) to create a clustered pyramid bar chart. xlPyramidBarStacked (or 110) to create a stacked pyramid bar chart. xlPyramidBarStacked100 (or 111) to create a 100% stacked pyramid bar chart. xlBarClustered (or 57) to create a clustered bar chart. xlBarStacked (or 58) to create a stacked bar chart. xlBarStacked100 (or 59) to create a 100% stacked bar chart. xlConeBarClustered (or 102) to create a clustered cone bar chart. xlConeBarStacked (or 103) to create a stacked cone bar chart. xlConeBarStacked100 (or 104) to create a 100% stacked cone bar chart. xlCylinderBarClustered (or 95) to create a clustered cylinder bar chart. xlCylinderBarStacked (or 96) to create a stacked cylinder bar chart. xlCylinderBarStacked100 (or 97) to create a 100% stacked cylinder bar chart. VBA construct: Left parameter of the Shapes.AddChart2 method. ChartDestination is a Range object representing the cells where you want the newly-created clustered or stacked bar chart to be located. You can usually return a Range object with constructs such as the Worksheet.Range, Worksheet.Cells (with Range.Item), Range.Offset or Range.Resize properties. If you explicitly declare an object variable to represent ChartDestination, use the Range object data type. The Range.Cells and Range.Item properties (Cells(1)) return a Range object representing the first (top-left corner) cell within ChartDestination. The Range.Left property returns a value representing the distance, in points, between the left edge of column A and the left edge of ChartDestination. Because of the above, “ChartDestination.Cells(1).Left” sets the left edge of the newly-created clustered or stacked bar chart to be at the left edge of ChartDestination. VBA construct: Top parameter of the Shapes.AddChart2 method. The Range.Top property returns a value representing the distance, in points, between the top edge of row 1 and the top edge of ChartDestination. Because of the above, “ChartDestination.Cells(1).Top” sets the top edge of the newly-created clustered or stacked bar chart to be at the top edge of ChartDestination. VBA construct: Width parameter of the Shapes.AddChart2 method. The Range.Width property returns a value representing the width, in points, of ChartDestination. Because of the above, “ChartDestination.Width” sets the width of the newly-created clustered or stacked bar chart to be the width of ChartDestination. VBA construct: Height parameter of the Shapes.AddChart2 method. The Range.Height property returns a value representing the height, in points, of ChartDestination. Because of the above, “ChartDestination.Height” sets the height of the newly-created clustered or stacked bar chart to be the height of ChartDestination. VBA construct: NewLayout parameter of the Shapes.AddChart2 method. The chart title is displayed. The legend is displayed only if the bar chart contains multiple series. You specify NewLayout's value as a Boolean (True or False). If you set NewLayout to True, the new dynamic formatting rules apply. If you set NewLayout to False, the new dynamic formatting rules don't apply. Description: The Shape.Chart property returns a Chart object representing the chart contained within the shape. For purposes of this macro structure, the Chart object returned by Shape.Chart represents the newly-created clustered or stacked bar chart. Item: Worksheet.Shapes.AddChart2(Style:=-1, XlChartType:=ChartType, Left:=ChartDestination.Cells(1).Left, Top:=ChartDestination.Cells(1).Top, Width:=ChartDestination.Width, Height:=ChartDestination.Height, NewLayout:=Boolean).Chart. VBA construct: objectexpression part of the Set statement and value part of the assignment (=) operator. Description: This expression returns a Chart object representing the newly-created clustered or stacked bar chart. This Chart object is assigned to myChart. VBA construct: Object variable of the Chart object data type. Description: myChart represents a reference to the newly-created clustered or stacked bar chart. Description: The Chart.SetSourceData method sets the source data range for myChart. VBA construct: Source parameter of the Chart.SetSourceData method. Description: The Source parameter of Chart.SetSourceData specifies the cell range containing the source data for myChart. SourceDataRange is a Range object representing the cell range that contains the source data for myChart. You can usually return a Range object with constructs such as the Worksheet.Range, Worksheet.Cells (with Range.Item), Range.Offset or Range.Resize properties. If you explicitly declare an object variable to represent SourceDataRange, use the Range object data type. The clustered bar chart is located over cells H5 to M24 of myWorksheet (myChartDestination). The following image illustrates the results of executing the macro example. An embedded clustered bar chart is created over cells H5 to M24. The source data for this chart is in cells A5 to F10. Activate the worksheet containing the source data. Select the cell range containing the source data. Description: SourceDataWorksheet represents the worksheet where the cell range containing the source data for the clustered or stacked bar chart is located. Use constructs such as the Workbook.Worksheets property to return the appropriate Worksheet object. If you explicitly declare an object variable to represent SourceDataWorksheet, use the Worksheet object data type. Description: The Activate method makes SourceDataWorksheet the active sheet. The main reason for including this statement is that, generally, you can't select a cell on a worksheet that isn't active. If SourceDataWorksheet is already the active worksheet, you may omit this statement. Description: Range object representing the cell range that contains the source data for the clustered or stacked bar chart. Description: The Select method selects SourceDataRange. Description: ChartDestinationWorksheet represents the worksheet where you insert the newly-created clustered or stacked bar chart. Use constructs such as the Application.ActiveSheet property or the Workbook.Worksheets property to return the appropriate Worksheet object. Description: The Worksheet.Shapes property returns a Shapes collection representing all the shapes within ChartDestinationWorksheet. Each Shape object within the Shapes collection represents an object in the drawing lawyer of the worksheet. Description: The Shapes.AddChart2 method creates a chart. Shapes.AddChart2 returns a Shape object representing the newly-created clustered or stacked bar chart. This Shape object is added to the Shapes collection representing all the shapes within ChartDestinationWorksheet. The following image illustrates the results of executing the macro example. An embedded stacked bar chart is created over cells H5 to M24. The source data for this chart is in cells A5 to F10. Create a clustered or stacked bar chart with the Shapes.AddChart method. Description: The Shapes.AddChart method creates a chart. Shapes.AddChart returns a Shape object representing the newly-created clustered or stacked bar chart. This Shape object is added to the Shapes collection representing all the shapes within Worksheet. In Excel 2013, Microsoft introduced the AddChart2 method. AddChart2 is generally more powerful and easier to work with than AddChart. However, AddChart continues to be supported and, therefore, macros that use AddChart work appropriately in Excel 2007 and later. VBA construct: XlChartType parameter of the Shapes.AddChart method. VBA construct: Left parameter of the Shapes.AddChart method. VBA construct: Top parameter of the Shapes.AddChart method. VBA construct: Width parameter of the Shapes.AddChart method. VBA construct: Height parameter of the Shapes.AddChart method. Item: Worksheet.Shapes.AddChart(XlChartType:=ChartType, Left:=ChartDestination.Cells(1).Left, Top:=ChartDestination.Cells(1).Top, Width:=ChartDestination.Width, Height:=ChartDestination.Height).Chart. This macro is the rough equivalent to a previous example (createEmbeddedClusteredBarChart). 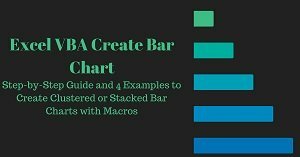 The main difference between both macros is the VBA construct they rely on to create the embedded clustered bar chart. createEmbeddedClusteredBarChart works with the Shapes.AddChart2 method. This method was introduced in Excel 2013 and isn't backward-compatible. Therefore, the createEmbeddedClusteredBarChart doesn't work appropriately in Excel 2007 or Excel 2010. The following macro example works with the Shapes.AddChart method. This method is compatible with Excel 2007 and later. Therefore, this macro works appropriately with Excel 2007, Excel 2010, Excel 2013 and Excel 2016. The resulting embedded clustered bar charts aren't identical. One of the reasons for some of these differences is the fact that the AddChart2 method accepts some additional parameters (particularly Style and NewLayout) that have no direct equivalent in the AddChart method. Create a chart with the Charts.Add2 method. Assign the Chart object representing the newly-created chart to the myChart object variable. Specify the source data for the newly-created chart with the Chart.SetSourceData method. Specify that the newly-created chart is a clustered or stacked bar chart with the Chart.ChartType property. The object reference assigned to myChart is the Chart object representing the newly-created clustered or stacked bar chart, as returned by the Charts.Add2 method. The value assigned to myChart is the Chart object representing the newly-created clustered or stacked bar chart, as returned by the Charts.Add2 method. Description: The Charts object is a collection representing all the chart sheets within the applicable workbook. Each chart sheet is represented by a Chart object. Description: The Add2 method creates a new chart sheet and returns a Chart object representing this newly-created chart sheet. VBA construct: Before and After parameters of the Charts.Add2 method. Description: The Before and After parameters of Charts.Add2 specify the sheet before (in the case of Before) or after (in the case of After) which the newly-created chart sheet (containing the clustered or stacked bar chart) is added. Identify the appropriate sheet (BeforeSheet or AfterSheet) as an object. For these purposes, you can rely on constructs such as the Workbook.Sheets, Workbook.Charts or Workbook.Worksheets properties. If you omit both Before and After, the newly-inserted chart sheet is located before the active sheet. VBA construct: NewLayout parameter of the Charts.Add2 method. Description: Statements within the With… End With statement are executed on the Chart object represented by myChart. Description: Chart.ChartType sets the type of a chart. The Chart.ChartType property is the property to which the value is assigned. The value assigned to ChartType is the value represented by ChartTypeValue. VBA construct: Built-in constant or value from the XlChartType enumeration. The chart sheet containing the stacked bar chart is located before the first sheet within ThisWorkbook. The following image illustrates the results of executing the macro example. A stacked bar chart is created on a new chart sheet, which becomes the first sheet of the workbook. The source data for this chart is in a separate worksheet.